Photo Caption: Angelo Zecca, DSc, Justice Studies, School of Professional Studies, and Mary Slavin, PhD, Humanities and Social Sciences, School of Liberal Arts, were recognized during the 2017 Berkeley College Faculty Recognition Awards dinner, held on November 2, 2017, at Battery Gardens in Manhattan, NY. Dr. Zecca, of South Brunswick, in Middlesex County, NJ, received the Commitment to Students Award. “Teaching plays an important role in shaping and changing the culture of our students, and truly prepares them for the future,” he said. “I believe in being real with my students. I know it is something they appreciate and that it will build a trust that will help them achieve success in their careers and goals.” Dr. Slavin, of Edison in Middlesex County, NJ, was recognized among the inaugural group of Berkeley College Master Faculty. Master Faculty demonstrate commitment to students, commitment to the College, and excellence in teaching. 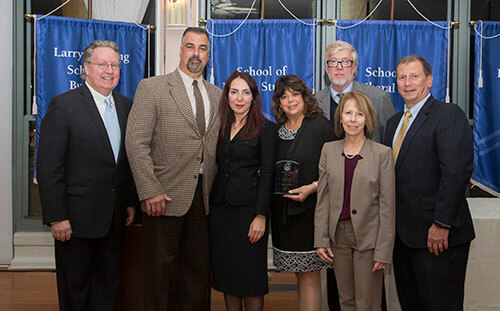 Above (L to R) are Michael J. Smith, President of Berkeley College; Dr. Zecca; Eva Skuka, MD, PhD, Dean, School of Health Studies; Janette Rodriguez, RMA, Medical Assistant program, School of Health Studies; Michael McAteer, DBA, Dean, School of Professional Studies; Beth Castiglia, PhD, Provost; and Kevin L. Luing, Board Chairman. Below (L to R) are President Smith; Master Faculty including Dr. Slavin; Richard Olivieri, JD, Legal Studies, School of Professional Studies; Diane Maglio, Fashion, Larry L. Luing School of Business®; Paul Pensabene, PhD, Management, Larry L. Luing School of Business; Joel Reichart, PhD, Management, Larry L. Luing School of Business; Patricia Cowan, English, School of Liberal Arts; Shelly Rosen, Management, Larry L. Luing School of Business; Patricia Gallagher, RN, Nursing and Patient Care Technician program, School of Health Studies; Melissa Baralt, PhD, Math and Sciences, School of Liberal Arts; and Byron Hargrove, PhD, Director, Honors Program and Humanities and Social Sciences, School of Liberal Arts; Dr. Castiglia; and Mr. Luing.